New Year’s Resolutions – Make Them? So tomorrow starts a new year. To be completely honest, I am OVERJOYED to start 2010! For our family 2009 was the pits! Yes, we have a lot to be thankful for, but 2009 was exhausting physically, mentally, and financially. As a lot of the country experienced, my husband suffered a job change, 2 knee surgeries and we now own 2 houses thanks to the lovely economy! There are some bright spots in our year – the highlight being that after almost 3 years of waiting we finally have an infant daughter in our family that will be bringing home from Asia in 2010! Yes, I will have a short daughter – but that’s fine! We are an equal opportunity family. She will be joining the crazy mix of 4 big brothers. I did my job of repopulating the world with 4 tall boys that will someday turn into 4 tall men! You tall women can thank me later! So, looking back on 2009, I set a few goals a.k.a New Year’s resolutions. They mostly involve finding more time for the important things in my life. I want to be able to work smarter and not harder in order to spend more time with my precious children. Of course, I would also like to lose a few (or more than a few) pounds (dang it) and feel healthier this next year. So, I thought I’d see how you do with setting goals. Congratulations go out to the winner of our drawing for a $40 gift certificate for eShakti’s custom made clothing for women. Drum roll please…..
We will have a new contest starting January 1st, so check back for details. Today is the last day to enter our contest giveaway for a $40 gift card for women’s custom made clothing courtesty of eShakti.com. Don’t forget to enter here by adding a comment. Due to the changing rules on online blogs and businesses, Tall Clothing Mall, LLC has created our disclosure. I know it’s long, but bear with me. Tall Clothing Mall incorporates several aspects of revenue that I felt like I should make it comprehensive as well as take the opportunity to share what Tall Clothing Mall and this blog are all about. Tall Clothing Mall, LLC owns Tall Clothing Mall Blog and it is a blog written and edited by me, Krista Mayne and from time to time, other guest posters. It’s sole purpose is to help tall people and plus size people find clothes that fit and help them look and feel fabulous! I take great pride in being one of the most comprehensive resources for tall women and tall men by showing you which tall clothing stores and other stores sell long length items, or other clothing items you can add to your wardrobe. By creating an online “Tall Clothing Mall”, we hope to give you sense of community and make your shopping experience easy. I spend a crazy amount of time working on this website and blog. Naturally, I have to make some grocery money to justify the crazy number of hours I work helping everyone out. Therefore, Tall Clothing Mall, LLC accepts forms of cash advertising, sponsorship, paid insertions and other forms of compensation. For example, many of the links you click on that take you to other stores for shopping, pay me a small commission for the referral. Also, you’ll know when I do a paid post because it will be distinguished as a ”sponsored” or paid post. All compensation agreed upon is for my time to create the content. My time is valuable! I will never be influenced by any form of compensation. I have strong opinions and integrity, therefore I will be honest in my judgment and recommendations to my readers. You can be assured that if I don’t love the product, or think it’s old fashioned or outdated, – I won’t promote them. Providing quality and relevant content for my readers is extremely important to me and can be expected on Tall Clothing Mall about 5 days a week. I do participate in fun giveaways with companies that I love. From time to time, I may be given the opportunity to try out the product for free too. I always disclose that I received a free product to try out. Often, we offer giveaways, without us receiving anything too! I will always write my honest opinions and experiences. The opinions expressed by me on this blog or in social media are purely my own. For questions about this website, feel free to contact me directly at admin at tallclothingmall dot com. If you are still in need of a last minute gift for someone tall, or for anyone (we don’t discriminate), there are still a few options. For the ultimate last minute gift, send an egift card by email or print one off on your print and place in a card. Amazon.com For one day ship order by Dec 23 at 4:30 PST. Amazon Egift Cards can be sent anytime. You can either email them an egift card, or use your home computer to print off a gift card and wrap it up as a gift or put it in a card of your own. Eddie Bauer in order to arrive by Christmas ship by 1 pm EST on Dec 23rd and pay for Express Plus upgrade. Nordstrom.com purchase a virtual gift card anytime. Zappos.com order by 1 pm EST on Dec 23, or send an online E-Gift certificate anytime. Most teens that we know, don’t have a lot lot of money for clothes. So, we recommend, buying clothing that fits well, yet is affordable. That way you can mix it up with other pieces without breaking the bank. Today we feature an outfit is perfect for hanging out at home or with friends. 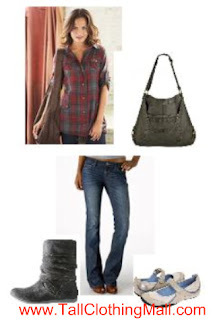 The trendy plaid tunic is a long length of 31″ long. It has rolltab sleeves, so no worry about sleeves being long enough. XS-3XL. Everyone needs a comfy, yet stylish pair of jeans. We like Alloy’s Revolt rhinestone bootcut tall jeans with 37″ inseam and flattering mid-rise. Sizes 1-25. To finish off this outfit, add an affordable Mossimo large pocket hobo bag and your choice of short boots or a super comfy pair of weekend shoes by Privo. You may also like our post on women’s tall outfit: what to wear skiing on our Tall Snob Blog. Be sure and email us your tall style requests and we will be happy to help you figure out what to wear. I get lots of requests for men’s extra long athletic pants. 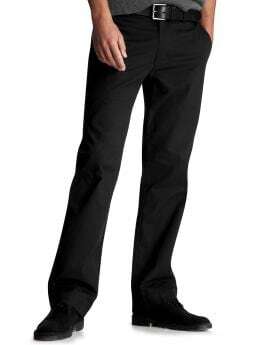 Many are having great success with these this pair of men’s tall athletic pants with 37″ inseams. You can choose to have them with or without cuffs. They come in a variety of sizes from MT-10XLT. Big and Tall World’s tall fleece sweatpants with 37″ inseam. Choose from cuffs, or no cuffs. Sizes MT-10XLT. Vertical Athletics Got Game Pants – supposed to be for people over 6’2″. Here are the inseams – M-34″, L-34.5″, XL-35″, XXL 35.5″ . Vertical Athletics MVP Pants – supposed to be for people over 6’2″ L-2XL. You tall guys, if you have a great resource for extra tall nylon pants or any other tall athletic pants, please share with us in the comments below. Everyone wants them, but they are hard to find. It’s getting close to Christmas. Do you need some gift ideas for tall people? You can’t go wrong with a gift card or an egift card. That way they can pick out whatever they want. We have a nice selection of gift cards and egift cards. Today only, save 25% off sitewide at Gap.com with code “HOORAH”. Yesterday they had a coupon end that was 20% off, so this is a great deal! Shipping is a flat rate of $7 and coupon ends today, December 16th. On Christmas Day we are giving away a $40 gift card courtesy of eShakti.com. They sell affordable women’s custom made clothing in pants, coats, dresses, skirts, shirts and much more. Their size range is great from size 0-26. Here is my honest review. I thought the coat fit perfectly. The measuring process was easy and in the comment section I was even able to tell them the exact length I wanted. After getting this coat, I probably would have chosen a different style as the collar was a bit large and doesn’t lay down quite flat. I will fix this by adding a snap. I like that it is lined inside. The wool is not as heavy as I would have like as I live in Colorado and it’s pretty cold here. I also would have liked to have some pockets. I thought the sewing and seaming are high quality. Overall I am pleased and will use this as a dress coat for church and other dressy occasions (when it’s not below zero outside). I ordered the custom made coat and it came to my house by UPS and arrived exactly 7 days after I ordered it. I was impressed at the speed. Now is Your Chance to Enter the Contest for $40 in women’s custom made clothing. Head on over to eShakti and browse through their website. Let me know in a comment below, what custom made item(s) you absolutely love. It’s as simple as that. Mention this giveaway on your site and put a link to it. Then come back here and add another comment after this entry to a link of where you have entered it on your website or blog. Then you have earned 2 entries ( and some free press for your blog, etc). Do a Twitter post or Facebook post about the giveaway and then enter another comment below, with a link. Wow, you’ve just earned 3 chances to win. The giveaway is open to everyone and you can enter until midnight on Christmas Eve Dec 24th. The winner will be announced Christmas morning Dec 25, 2009. (Note) If your comment doesn’t link back to your profile or blog where I can find your email, or you don’t have a blog, then you must leave your email in the comment so I can contact you if you win. You will have 48 hours to respond or I will choose a new winner. Winners will be chosen the old fashioned way by number tags thrown into a bowl. Good luck! Disclosure: I may receive a commission if you place an order and I was given a free coat to try out the ordering process.